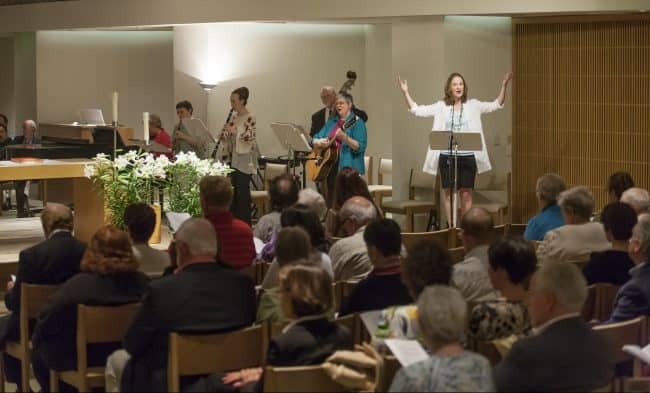 We give thanks to the God who brings us together each week at Eucharist, our center of prayer, where we, as a community of faith, are strengthened and empowered for service. As Dominicans, we welcome community. We seek to find God’s face in one another. Our community gathers in Dominican Chapel at Marywood for Sunday Eucharist to celebrate God’s love in our daily lives. The preaching, music and choir, and commitment to inclusivity in roles and relationships is rooted in our Dominican Spirituality. Nourished by God’s Word and by Eucharist we go forth to serve God. Our Daily Prayer and Worship Calendar is below. Prayer and worship locations vary between Dominican Chapel/Marywood (DCM), Chapel of the Word at Marywood Health Center (MHC), and St. Catherine of Siena Chapel at Aquinata Hall. All are located on our Marywood Campus at 2025 Fulton Street East. Grand Rapids, Michigan. Parking for Dominican Chapel/Marywood and St. Catherine of Siena Chapel is in our main lot on Lakeside Drive. Parking for Chapel of the Word at Marywood Health Center (MHC) is at 111 Lakeside Drive.